At the Mob Museum in Las Vegas, James "Whitey" Bulger is just one of the many gangsters whose photos line the walls. His FBI Most Wanted picture from the 16 years he was on the run sits behind a glass case. Bulger was also an FBI informant. "You can't be a snitch and be out in the yard," said Michael Franzese, a former New York mobster. Franzese denounced organized crime years ago and now travels the world sharing his story. He's also a fixture on the Las Vegas entertainment scene with a role in "A Mob Story," which debuted this summer at the Plaza Hotel and Casino. "I mean he was really, really a guy that was not liked by my former friends," said Franzese. "Some of my associates in New England, you know the word was really out on him. And that if anybody were to see him that you were to take care of business with him." Even at his advanced age and having suffered nine heart attacks in prison, both Schumacher and Franzese agree it appears Bulger could not escape his past crimes which included 11 murders. "He was not a threat to anyone," said Schumacher. "But yet he had inflicted so much pain on others it appears the retribution finally came to roost." "It would be a feather in someone's cap in there. Anybody that took him out," Franzese said. Not only is Bulgar featured in the Mob Museum but he has several ties to Las Vegas. It is believed that he visited Las Vegas several times while he was in hiding to party and gamble. Before that, Bulgar reportedly sent two hitmen to kill Pete Poulos in the desert outside of Las Vegas in the late 1960s. 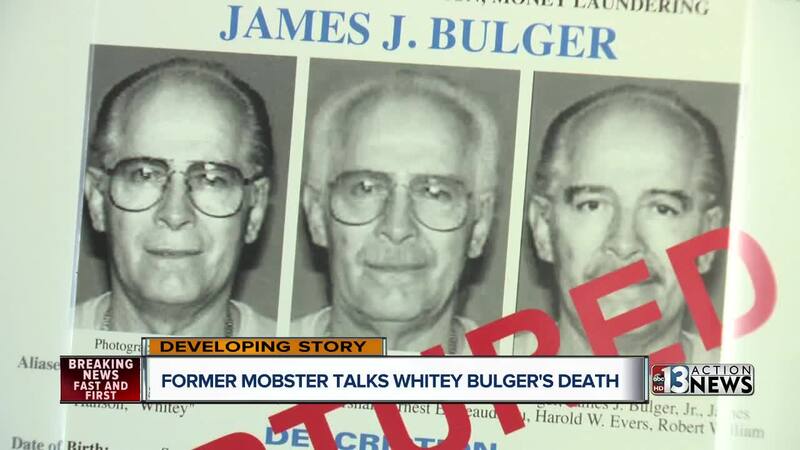 However, the investigation into Bulgar’s connection to the murder was supposedly shut down because he was an informant for the FBI at the time. The FBI is investigating the circumstances of Bulger's death.